France is still celebrating today after its national football team brought home football's biggest prize after a thrilling final in Moscow. The French team beat Croatia 4-2 in Sunday's final, prompting wild scenes across the country. The focus of the celebrations was the Champs-Elysees in Paris, where tens of thousands gathered after the final whistle. The French capital is in party mood, and if you're looking to head to Paris to make the most of the feelgood factor then take a look at our travel insurance options and make sure you're covered before you set off. "Eternal Happiness" read Monday's headline in sports daily L'Equipe, summing up the mood of many after the French team's thrilling final victory. The French, though, are more enamoured of the players, like 19-year-old star Kylian Mbappe, who scored the fourth goal, and of their coach, Didier Deschamps, with a parody photo circulating online suggesting Paris' most famous avenue should be renamed "Deschamps Elysees". Sports minister Laura Flessel said on Europe-1 radio that the victory allows France's youth - like those in the poor suburbs where many of the players grew up, "to dare to believe in their dreams". The win comes 20 years after France's first cup win - on home soil, after a 3-0 defeat of Brazil in Paris - but many commentators note that the 2018 vintage comes at a time when the people feel needy. 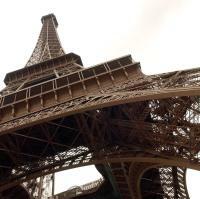 Parisian Goffrey Hamsik said: "It represents enormous things. "We've had lots of problems in France these past years," he added, recalling deadly terror attacks. "This is good for the morale ... Here, we are all united. We mix. There is no religion, there is nothing, and that's what feels good." As night fell, the Eiffel Tower flashed 1998-2018 to mark France's two titles. The Arc de Triomphe was awash in the national colours, lit with the rooster symbol, the faces of the winning team and the words "Proud to be Blue", or French.